Daniel grew up in York, Pennsylvania, born into a large family where there was always plenty of artistic and musical stimulation present. His mother, an accomplished artist, designed sets for the local community theatre productions, exposing Daniel and his siblings to many of the great shows and scores of the 20th century. Of course, the record player and radio were nearly always blaring in the house, spewing forth a myriad of different musical styles and genres from jazz to pop to Brazilian to classical. There was an unused trumpet lying about that belonged to an older brother who had stopped playing as he had gotten older, and the smell and feel of the instrument captivated him. So, after years of listening to Herb Alpert and the Tijuana Brass, among other artists, he selected the trumpet to study at the ripe old age of nine. With the aid of a few local private trumpet teachers, and a fair to middling psychotherapist, he took to the trumpet, and after being exposed to both jazz and classical genres, as well as the occasional pit orchestra, he found his voice on the demanding instrument; earning trips to local, regional and state bands and orchestras, and finally a short tour of Europe after his junior year of high school, as principal trumpet with the Pennsylvania Ambassadors of Music. Following graduation, Daniel attended the University of Miami in Coral Gables, Florida, at first majoring in Prelaw studies. 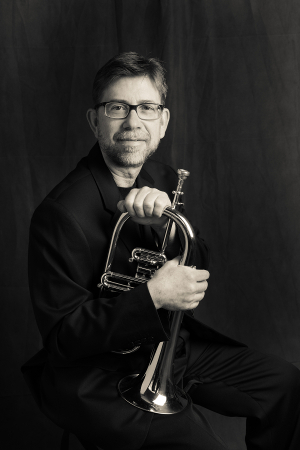 However, by the end of his freshman year, he made the decision to switch to the music school, where he earned his Bachelor of Music in Studio Music and Jazz in Trumpet Performance. He played locally in Miami until August of 1985, at which time he migrated to the Bay Area, where he has made his home since then, along with his wife, Zomar, their son, Pablo and their vociferous dog, Fezz. Some of his early influences include Al Hirt, the Beatles, Blood Sweat and Tears, Chicago, and the short-lived but ground breaking band Chase, as well as great performers in jazz such as Louie Armstrong, Freddie Hubbard, Maynard Ferguson, Miles Davis , John Coltrane, and Bill Evans. Daniel was fortunate to study with, and be influenced by great players and educators such as John King, Gilbert Johnson, Stephen Schmidt, Gary Lindsay, Al Hemiola and John Coppola, among others. "B still, you can't really move anyway"
"C you on the other side (this aisle is plumb full)"
and the popular "D3 killed the B3", which, rumor has it, was nearly selected to be on one of the Buggles' albums in the late 80's. Daniel currently freelances in the Bay Area, playing in a wide variety of groups ranging from big bands to shows, and from classic rock and pop to small group jazz, as well as the odd "Call to the Post" for the occasional horse race.